Advances in technology may help to improve bladder cancer diagnosis, staging, and treatment. Biomarkers have been used to aid in diagnosis and surveillance of patients with bladder cancer. Standard tools for diagnosis and staging incorporate the use of urine cytology and computer tomography to examine the upper tracts. Several urinary tumor markers may assist to identify and risk-stratify the probability of current and future (anticipatory) risk of bladder cancer. Fluorescence cystoscopy, utilizing 5-ALA and hexaminolevulinate (HAL) as photosensitizing agents, has been shown to improve the detection of papillary and flat bladder lesions, compared to conventional white light cystoscopy. Prospective phase III clinical trials have demonstrated improved diagnostic ability, enhanced tumor resection, and reduced tumor recurrence. Optical coherence tomography is an emerging technology that shows promise in revealing subsurface microarchitecture information about bladder lesions in real-time, potentially leading to more accurate staging. Narrow-band imaging may augment standard endoscopic tools by providing increased contrast between normal and abnormal tissue on the basis of neovascularity. Confocal laser endoscopy has the potential to provide images of even higher resolution. 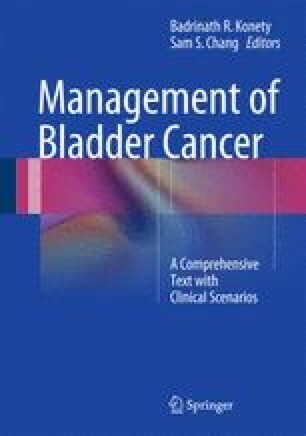 We present an overview of urine biomarkers and the strengths and weaknesses of these imaging modalities and examine their potential impact on the diagnosis and management of bladder cancer.